Contemporary map of the Slavic speaking countries of Europe. South Slavs appear in dark blue, East Slavs in dark green, and West Slavs in light green. Pan-Slavism, a movement which crystallized in the mid-19th century, is the political ideology concerned with the advancement of integrity and unity for the Slavic peoples. Its main impact occurred in the Balkans, where non-Slavic empires—the Byzantine Empire, Austria-Hungary, the Ottoman Empire, and Venice—had ruled the South Slavs for centuries. Extensive Pan-Slavism began much like Pan-Germanism, both of which grew from the sense of unity and nationalism experienced within ethnic groups after the French Revolution and the consequent Napoleonic Wars against European Monarchies. Like other Romantic nationalist movements, Slavic intellectuals and scholars in the developing fields of history, philology, and folklore actively encouraged the passion of their shared identity and ancestry. Pan-Slavism also co-existed with the Southern Slavic independence. The first pan-Slavists were the 16th-century Croatian writer Vinko Pribojević and the 17th-century Aleksandar Komulović, Bartol Kašić, Gundulić and Croatian Catholic missionary Juraj Križanić. Some of the earliest manifestations of Pan-Slavic thought within the Habsburg Monarchy have been attributed to Adam Franz Kollár and Pavel Jozef Šafárik. The movement began following the end of the Napoleonic Wars in 1815. In the aftermath, the leaders of Europe sought to restore the pre-war status quo. At the Congress of Vienna, Austria's representative, Prince von Metternich, felt the threat to this status quo in Austria was the nationalists demanding independence from the empire. While their subjects were composed of numerous ethnic groups (such as Italians, Romanians, Hungarians, etc. ), most of the subjects were Slavs. The Pan-Slav congress met during the revolutionary turmoil of 1848. Young inhabitants of Prague had taken to the streets and in the confrontation, a stray bullet had killed the wife of Field Marshal Alfred I, Prince of Windisch-Grätz, the commander of the Austrian forces in Prague. Enraged, Windischgrätz seized the city, disbanded the congress, and established martial law throughout Bohemia. The first Pan-Slavic convention was held in Prague on June 2 through 16, 1848. The delegates at the Congress were specifically both anti-Austrian and anti-Russian. Still "the Right"—the moderately liberal wing of the Congress—under the leadership of František Palacký (1798–1876), a Czech historian and politician, and Pavol Jozef Šafárik (1795–1861), a Slovak philologist, historian and archaeologist, favored autonomy of the Slav lands within the framework of Austrian (Habsburg) monarchy. In contrast "the Left"—the radical wing of the Congress—under the leadership of Karel Sabina (1813–1877), a Czech writer and journalist, Josef Václav Frič, a Czech nationalist, Karol Libelt (1817–1861), a Polish writer and politician, and others, pressed for a close alliance with the revolutionary-democratic movement going on in Germany and Hungary in 1848. However, the Russian Empire often claimed Pan-Slavism as a justification for its aggressive moves in the Balkan Peninsula of Europe and against Turkey. Pan-Slavism has some supporters among Czech politicians but never gained dominant influence, possibly other than treating Czechs and Slovaks as branches of a single multi-ethnic nation. The creation of an independent Czechoslovakia made the old ideals of Pan-Slavism anachronistic. Relations with other Slavic states varied, sometimes being tense. Even tensions between Czechs and Slovaks had appeared. Pan-Slavism in the south would often turn to Russia for support. The Southern Slavic movement advocated the independence of the Slavic peoples in the Austro-Hungarian Empire, Republic of Venice and the Ottoman Empire. Some Serbian intellectuals sought to unite all of the Southern, Balkan Slavs, whether Catholic (Croats, Slovenes), Muslim (Bosniaks), or Orthodox (Serbs, Montenegrins, Bulgarians) as a "Southern-Slavic nation of three faiths"). Austria feared that Pan-Slavists would endanger the empire. In Austria-Hungary Southern Slavs were distributed among several entities: Slovenes in the Austrian part (Carniola, Styria, Carinthia, Gorizia and Gradisca, Trieste, Istria (also Croats)), Croats and Serbs in the Hungarian part within the autonomous Kingdom of Croatia-Slavonia and in the Austrian part within the autonomous Kingdom of Dalmatia, and in Bosnia and Herzegovina, under direct control from Vienna. Due to a different position within Austria-Hungary several different goals were prominent among the Southern Slavs of Austria-Hungary. A strong alternative to Pan-Slavism was Austroslavism, especially among the Croats and Slovenes. Because the Serbs were dispersed among several regions, and the fact that they had ties to the independent nation state of Kingdom of Serbia, they were among the strongest supporters of independence of South-Slavs from Austria-Hungary and uniting into a common state under Serbian monarchy. In 1863, the Association of Serbian Philology commemorated the death of Cyril a thousand years earlier, its president Dimitrije Matić, talked of the creation of an ethnically "pure" Slavonic people: "with God’s help, there should be a whole Slavonic people with purely Slavonic faces and of purely Slavonic character"
After World War I the creation of the Kingdom of Yugoslavia, under Serbian royalty of the Karađorđević dynasty, united most Southern Slavic-speaking nations regardless of religion and cultural background. The only ones they did not unite with were the Bulgarians. Still, in the years after the Second World War, there were proposals to incorporate Bulgaria into a Greater Yugoslavia thus uniting all south Slavic-speaking nations into one state. The idea was abandoned after the split between Josip Broz Tito and Joseph Stalin in 1948. This led to some bitter sentiment between the people of Yugoslavia and Bulgaria in the aftermath. At the end of Second World War, the Partisans leader Josip Broz Tito, a Croat and Slovenian, became Yugoslav president, and the country become a socialist republic. Tito advocated Brotherhood and unity which meant equality among the ethnic groups, including non-Slav minorities. This led to relatively peaceful co-existence and prosperity until the breakup of the federation. Although early Pan-Slavism had found interest among some Poles, it soon lost its appeal as the movement became dominated by Russia, and while Russian Pan-Slavists spoke of liberation of other Slavs through Russian actions, parts of Poland had been ruled by the Russian Empire since the Partitions of Poland. Historically, Poland often saw itself in partnership with non-Slavic nations most of the time, such as Hungary (see the phrase "Pole and Hungarian cousins be"), Saxony, Sweden or Lithuania under the Polish-Lithuanian Commonwealth from 1569 to 1795. Especially after 1795, Revolutionary and Napoleonic France was esteemed by most Poles at that time as the best champion for the reconstitution of their country as it was a mutual enemy of Austria, Prussia and Russia. The influence of 19th century Pan-Slavism had little impact in Poland except for creating sympathy towards the other oppressed Slavic nations to regaining independence. At the same time while Pan-Slavism worked against Austro-Hungary with South Slavs, Poles enjoyed a wide autonomy within the state and assumed a loyalist position as they were able to develop their national culture and preserve Polish language, something under threat in both German and Russian Empires. A Pan-Slavic federation was proposed, but on the condition that the Russian Empire would be excluded from such an entity. After Poland regained its independence (from Germany, Austria and Russia) in 1918 no major or minor force considered Pan-Slavism as a serious alternative, viewing Pan-Slavism as little more than a code word for Russification. During Poland's communist era the USSR used Pan-Slavism as propaganda tool to justify its control over the country. The issue of the Pan-Slavism was not part of the mainstream political agenda, and is widely seen as an ideology of Russian imperialism. Although Poland is a member of the Visegrád Group, which although is not Pan-Slavic as it includes one non-Slavic nation, but promotes co-operations among former Eastern Bloc Central European countries. It could be considered simultaneously a platform that promotes fraternity and integration among the West Slavs, who share a common, Central European culture and history, and having similar development. All four Visegrád members are also member of the Central European Initiative. Panslavism is popular in the large immigration from the former USSR to Slavic countries of the European Union. It expresses fierce populism, nostalgia for the Soviet era, and strong anti-Western sentiments. The authentic idea of unity of the Slavic people was all but gone after World War I when the maxim "Versailles and Trianon have put an end to all Slavisms" and was finally put to rest with the fall of communism in Central and Eastern Europe in late 1980s. With the breakup of federal states such as Czechoslovakia and Yugoslavia and the problem of Russian and Serbian dominance in any proposed all-Slavic organisation, the idea of Pan-Slavic unity is mostly considered dead. Varying relations between the Slavic countries exist nowadays; they range from mutual respect on equal footing and sympathy towards one another through traditional dislike and enmity, to indifference. None, other than culture and heritage oriented organizations, are currently considered as a form of rapprochement among the countries with Slavic origins. The political parties which include panslavism as part of their program usually live on the fringe of the political spectrum (e.g. in Poland candidates from Związek Słowiański got no more than few thousands votes). In modern times, the appeals to Pan-Slavism are often made in Belarus, Russia, Serbia and Slovakia. In 2006, Slovenian electronic group Laibach released the album Volk. It is a concept album consisting of re-interpretations of national anthems. Each track on the album is named for a country (e.g. "Germania," "España," "Yisra’el," "Zhonghuá") with the notable exception of "Slovania," which is based on "Hej Slovani," the anthem of the former Socialist Federal Republic of Yugoslavia, and unofficial anthem of Pan-Slavism. The song's accompanying video is a visual call for Pan-Slavic unity. The similarity of Slavic languages inspired many people to create Pan-Slavic languages, i.e., zonal constructed languages for all Slavic people to communicate with one another. Several of these languages were created in the past, but due to the Internet, many more Pan-Slavic languages were created in the Digital Age. The most popular modern Pan-Slavic language is Interslavic. 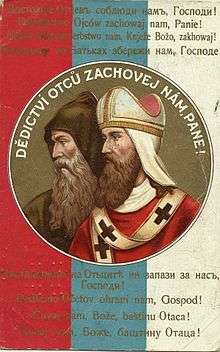 Pan-Slavic postcard depicting Cyril and Methodius, with the text "God/Our Lord, watch over our heritage/grandfatherland" in 9 Slavic languages. Pan-Slavism_in_Central_and_Southeastern_Europe_Panslavizm_v_Tsentralnoi_i_Yugo-Vostochnoi_Evrope_ A. Grigorieva Pan-Slavism in Central and Southeastern Europe // Journal of Siberian Federal University. Humanities & Social Sciences 1 (2010 3) 13-21. ↑ Robert John Weston Evans, Chapter "Nationality in East-Central Europe: Perception and Definition before 1848." Austria, Hungary, and the Habsburgs: Essays on Central Europe, c.1683-1867. 2006. ↑ See Note 134 on page 725 of the Collected Works of Karl Marx and Frederick Engels: Volume 14 (International Publishers: New York, 1980). ↑ See the biographical note on page 784 of the Collected Works of Karl Marx and Frederick Engels: Volume 14. 1 2 See Note 134 on page 725 of the Collected Works of Karl Marx and Frederick Engels: Volume 14. ↑ Frederick Engels, "Germany and Pan-Slavism" contained in the Collected Works of Karl Marx and Frederick Engels: Volume 14, pp. 156-158. Wikimedia Commons has media related to Pan-Slavism.